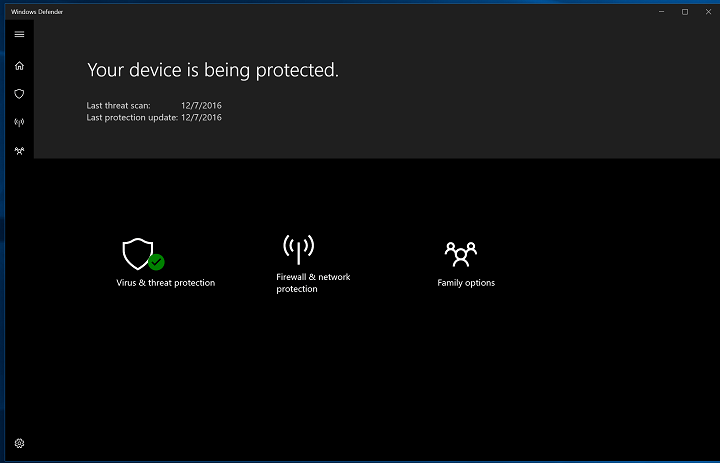 With the introduction of Windows 10, Windows Defender has become even more capable. This is great for Microsoft as most of its users previously used 3rd-party antivirus solutions. However, even though Windows Defender is a good service, it’s not always the primary choice for a lot of users. The reason? Frequent issues that emerged after its latest update, with many users reporting more than one problem after they’ve downloaded and installed the Creators Update. As we already stated, Windows Defender may be a good security solution — when it works as intended. However, users that managed to obtain the Creators Update experienced issues with Windows Defender. The most critical issue is related to sudden crashes and to make the things even worse, some of them were unable to locate the Windows Defender options under Settings. Restart your PC. Sometimes, a minor bug can cause a lot of trouble. Make sure to restart your PC before you move om to more advanced workarounds. After the procedure is finished, check for changes in Windows Defender. Uninstall the 3rd-party antivirus. Make sure to use only one security service because the presence of two will most certainly cause issues. Right-click the Start menu and, under Administrative shortcuts, select Control Panel. Disable both Private and Public networks. Try running Windows Defender again. If the problems are persistent after all of the above steps, you’ll need to turn to recovery options. Right-click Start and open Control Panel. Click Uninstall a program in the Category view. Navigate to an antivirus program on the list and Uninstall it. Clear the registry with a dedicated tool. Some registry issues can cause long scan times. We advise you to use some of these third-party tools to clean your registry. Don’t forget to back your registry up before the cleanup. Open Windows Defender from the notification area in the taskbar. After the process is finished, repeat the scanning process and look for changes. In the Search Windows bar, type gpedit.msc and open Local Group Policy Editor. In the right side window, locate the ”Turn off Windows Defender” policy. Double-click on this policy and click Enable within its properties. That should relieve you of possible annoyances caused by Windows Defender. From now on, you can use your preferred antivirus software solely. With the Creators Update, all-around security and performance maintenance options are located within Security Center. However, after the update, users are frequently annoyed by recurring reports and errors within the system. Ultimately, it seems that Microsoft made a tool that’s too diligent for its own good, and probably isn’t what they intended to do. However, this feature can be disabled so you won’t be prompted all the time about minor issues. Under the Windows Search, type regedit and open the Registry Editor. Backup your registry and continue with steps. In the right part of the window, you’ll see Start and Type inputs. Change their values to 3. Right-click taskbar and open the Task Manager. Under the Startup tab, disable Windows Defender Notification and save changes. Reboot your PC and you’ll be good to go. That should do it. If you have any other issues, alternative solutions, or questions regarding the subject, make sure to post them in the comments section that’s just below.